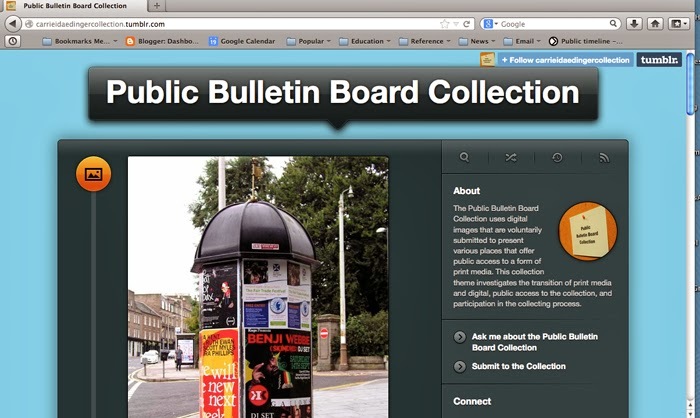 Almost a year ago, I introduced the Public Bulletin Board Collection theme. This collection theme investigates some of the broader contexts of my research with the “collection” project, such as public access to the collection, participation in the colleting process, and concepts concerning print and digital media objects. 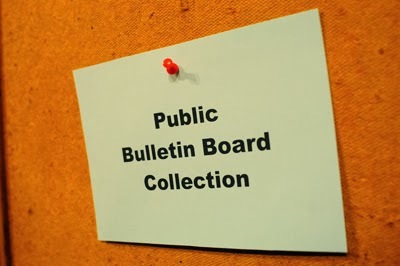 The Public Bulletin Board Collection has been recently relocated to a Tumblr Blog site. My decision to remove the collection theme from the project website was made because of the easier public accessibility of posting images and text. The Tumblr site offers an option of allowing people to submit posts with various media (images, texts, links) to contribute to the blog. The submissions have been sparse during a year’s time of promoting participation to the collecting process of this collection theme. I considered the first collecting process of submitting images through email to have two many steps. Since I am a generalist with html coding, I began to investigate pre-designed templates or sites that offered another option of participants posting information. In my March 27, 2013, New Collection Theme, blog post I referred to Olga Goriunova’s concepts of using media as an art platform, along with the engagement of direct subjective and societal involvement that develops the contemporary aesthetic practices of the Internet. I explored her five concepts to the preliminary investigations of the Public Bulletin Board Collection theme in the 2013 blog post. For this blog post concerning the relocation of the collection theme, I wanted to acknowledge one of the 5 concepts that pertain to the reason for having selected a different site. The concept is media’s relationship with agency. The variety of methods of how participants submit digital information with digital devices has not been altered. The digital communication medium is what has changed. Instead of using email in the collecting process between the participant and myself to submit information a blog program is used. The participant’s can directly attach their images and information of the location of the public bulletin board. This switch in the digital communication medium involves one site for submitting and presenting the contributions. The Tumbr site has it own agreement to public posting information. This brings about questions of who is really presenting and collecting the Public Bulletin Board Collection, Tumblr or myself. These questions of authorship between social media and people will be investigated as the collection develops. In addition, the other 4 concepts of Olga Goriunova’s will be examined too. I have moved the first 4 images from the Public Bulletin Board Collection over to the Tumblr site. View and participate in the collecting process on the Tumblr site.